If you’re looking at buying a new drill press, you are in the right place. Browse through our drill press reviews before making a decision. Our aim is to help you get the best value for money by giving you everything you need to make a well informed choice. The drill press has uses ranging from drilling into metal to wood-working, and much more. There’s a huge variety available on the market today that vary in features, power, size, portability and importantly, pricing. Fortunately these drill press reviews should help keep the decision making process as simple as possible for you. Finding the best drill press for you depends largely on what your personal needs are. For example, how much space do you have to put it in your garage or workshop? Depending on how much work space you have you may choose a floor, or benchtop drill press. Your budget is also an important factor you should consider when looking at different models. Price range varies significantly with different brands, models and features. Also, if you want to drill specific small items like jewelry, choose a mini drill press. The WEN 4208 8-inch, 5 speed benchtop model is a high quality machine at a very reasonable price. Most would agree it’s likely one of the best drill presses under $100. It is built to a high standard of construction and has a cast iron base, table, and head. This ensures smoothness and accurate holes. The drill also has ball bearings for durability of the motor, and to keep it smooth and balanced. At a respectable 1/3hp the motor is powerful enough to handle all the DIY tasks you can throw at it. This model is versatile, high quality, and great value for money. That’s why it earns its spot as my top pick. I think it’s perfect for the home work-shop or just everyday DIY. The SKIL 3320-01 model 5 speed, 10 inch drill press is another great entry level option. Consumers agree that it is a robust and precise piece of machinery. It also offers fantastic value for money. Featuring an X-2 2-Beam laser guiding system that makes precision hole alignment a cinch. Although it is a reasonably compact machine, it certainly has sufficient power for a variety of materials and tasks. The motor is 3.2 amp and has 5 RPM settings (570 – 3050). Consumers note that the assembly process for this model is very straightforward, so you can get to work right away! The base and work table are cast iron, the design and mechanical aspects are top notch too. For the price and quality it’s hard to find a better addition to the workshop. The Craftsman 12 inch drill press is a solid choice and has a reasonable price tag for a 12 inch machine. Especially since it comes with plenty of features like digital depth readout, and a laser cross-hair system for precision drilling. It is powered with a 3.5 amp motor which provides 1/2 hp. The speed settings vary from 355 to 3065 RPM, so the Craftsman can handle a good variety of tasks. Although not the most value for money, if the Craftsman is in your price range it could be right for you. The Shop Fox W1668 is a pretty decent option. Although it doesn’t offer the same value for money as some of other brands. The thing about this drill press that stands out is its versatility. One example is that it’s equipped with a kit to convert it into a sander – so you’re getting more features than just a drill. It also features a table swing of 360 degrees, and table tilt of 45 degrees left and right which can accommodate various types of projects. The power is provided by a 3/4 hp motor. It features 12 different speed settings from 250 RPM – 3050 RPM. The Delta 18-900L is a high quality product, and a favorite among professionals and serious DIYers alike. The 18 inch size allows for very large scale projects. the 18-900L is suitable for the most demanding of tasks and is equipped with a very impressive 16 different speed settings. This drill press uniquely features an auto-tensioning belt drive system. This system increases efficiency changing speeds and keeps consistent belt tension and motor-alignment. The 18-900L also features an independent depth-scale and micro-adjustable depth stops. That allows you to zero the scale and have it setup for precise repetitive drilling in mere seconds. 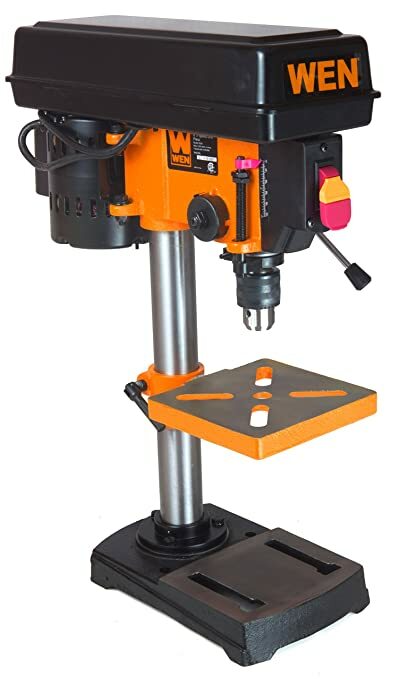 This machine is probably one of the best available, and might be out of the price range of the everyday hobbyist, but if you’re serious about having a top of the line drill press then this is a great choice. Is this drill press well built, and robust? The machine you choose must be solid and robust. Your purchase should be an investment in a tool that will last for years to come, so you should be sure that it’s well built to get maximum longevity out of it. Hopefully it will have no trouble remaining accurate and precise for its lifetime. Portable drill press, or fixed in place. Big/small? 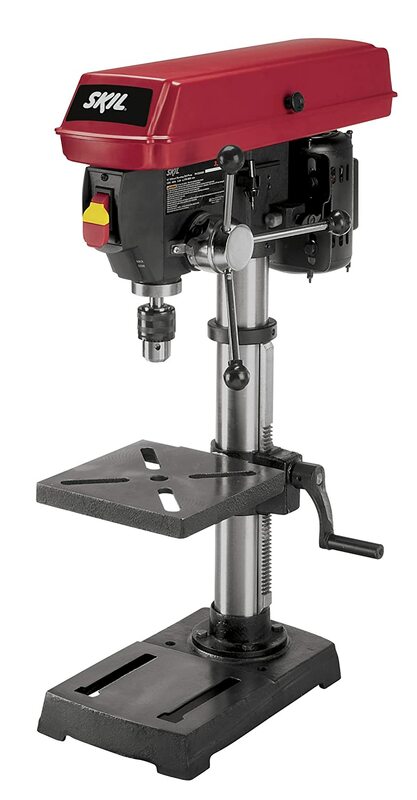 Based on the amount of available space you have to work in you could choose: a floor drill press (tall long column), or a bench top drill press (shorter column). Or a mini drill press. The main thing to remember here is that you should choose the one you think will be ideal for you. If you need something portable obviously a large floor drill press is much more difficult to transport. Drill presses measure their size by using the “throat capacity”. The distance between the column (vertical “pole” part of the machine) and the center of the chuck (piece which holds the “drill bit”). If a drill press has an 8 inch throat capacity, it can drill a hole in the center of a 16 inch diameter disc. It is therefore a 16 inch drill press. So effectively the size of the drill press is the throat capacity (column – chuck distance) multiplied by two. So consider the size of projects you want to use the drill press for when making a purchase. How much power do I need for my work? Power is an important consideration when choosing a drill press depending on what you want to use it for. Consider if you’re using your drill press for metal work or for wood. Power is measured in horsepower (HP). Anything with a motor that is 1/3 hp or more should be perfect for most jobs. However larger projects may require a drill press with more horsepower. A different spindle speed may be ideal, depending on your materials being used. most drill presses these days have a good variety of adjustable speed settings. If you plan to work with a lot of different materials then this is useful. Which accessories will I need for my drill press? There are some situations that you might want to have some additional accessories to make your life easier. An example is using a table to ensure good stability. Another popular addition is a drill press vise, which is used to ensure the piece you’re drilling stays exactly in place. whether you’re using it in your professional workshop, or just a garage. The size of your machine is an important factor worth considering. Often you’re better off with a bench top drill press because some spaces will be too small to make room for the large free standing floor drill press. Do you want the best drill press for metal? Or, perhaps for wood. Maybe you just want the most inexpensive drill press. Whichever is the case, just make sure to read our reviews so you know you’re buying what you need. 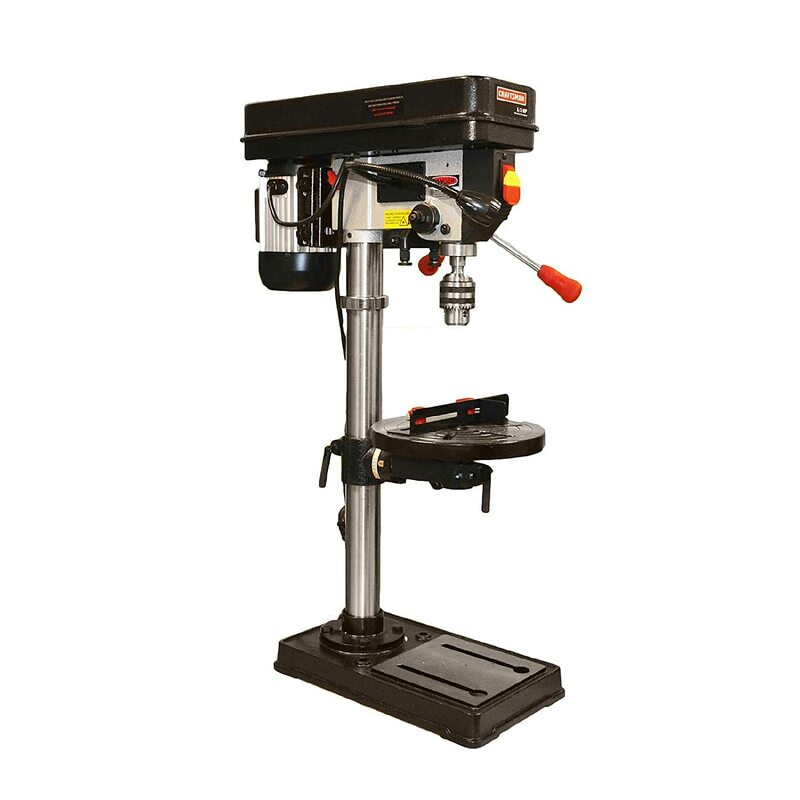 The two main categories of drill press are floor drill presses, and the benchtop drill presses. There is a lot of overlap in the use of these tools – and generally they are interchangeable. However, there are some specific differences you should be aware of when considering which one is right for you. Let’s take a closer look at these two different types. If you’re planning to be working with very large objects, then the floor design is the obvious choice. If you’re doing industrial scale work they’re also a far superior choice. As they can be bolted right into the floor of your workshop they are very rigid and sturdy. Because the column of the floor designed drill press starts much lower, you have much more swing distance, thus the ability to deal with bigger workpieces. If you choose the floor design you will be comfortably be able to do all that you would with a benchtop – however, due to their large size it may be inconvenient to install such a large machine. You’ll find that this design is the most common in the the average workshop. Due to the size of these they are much more portable than taller floor standing models, however still sturdy and able to tackle fairly large projects. The swing distance is still fairly substantial, but potentially too short for the type of large projects where you may need a floor model. 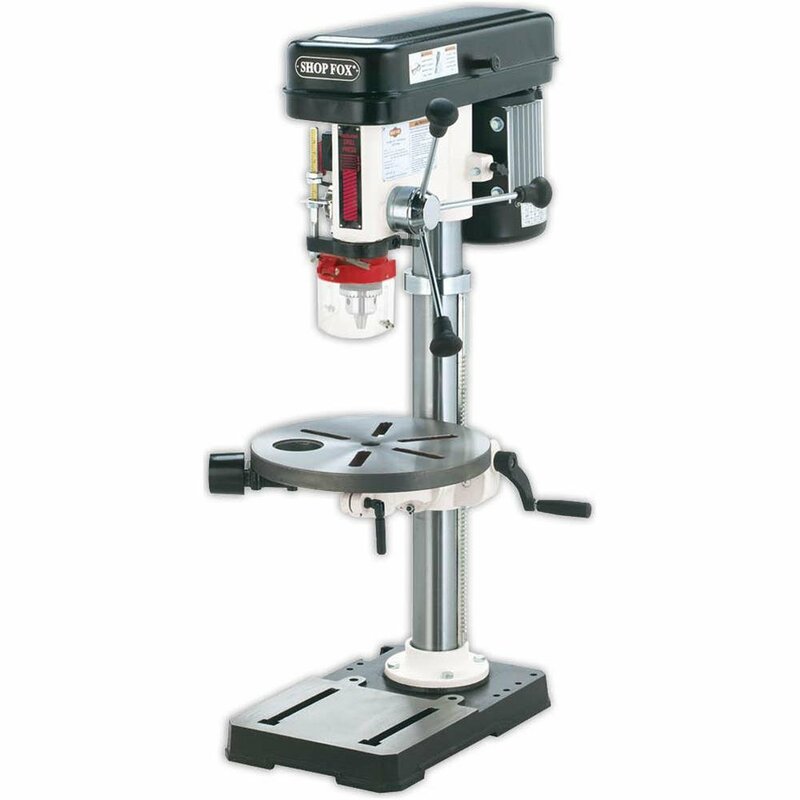 Benchtop drill presses are bolted directly onto your workbench, rather than onto the floor. Often the swing distance is around 8 inches, rather than 14-18inches like a floor drill press has. In most scenarios the bench-top style is perfectly suitable to get your job done. It’s also generally lower in price, and lighter. To pick the right one take some measurements in your garage or wherever you plan to install it and see how much space you have. There are literally hundreds of ways you can use a drill press. Covering all of the multitude of tasks that can be completed using this versatile tool would take forever. The benefits of using a good powerful drill press over a regular drill for your projects are numerous. Because of the design, you can operate with a much greater level of precision. The depth stop functionality lets you control the depth you want to drill to a much more precise degree. As well as this, for repeated drilling operations you will find it to be much more efficient. Once you have your measurements for depth set up it’s a breeze. Making precise and accurate holes efficiently has never been easier than it is with this tool. However aside from drilling holes you could also use it for other more unusual applications. You can do this by using special add-on attachments. Before getting too creative with how you use it. Be sure to familiarize yourself with all of its basic functionality first, so you can avoid injury or damaging the machine. As well as this it is also vitally important that you maintain and look after your machine – so you can keep using it effectively. Behind sawing, and hammering, drilling is one of the most important and frequent tasks a woodworker will have to do while working on their projects. Given the importance of this tool and the tasks it is used for, it’s a good idea to make sure you have it set up properly. this will ensure success and safety when it comes to completing your projects. The first tip, which cannot be overstated enough, is that you should follow the directions for setup and use found in the user manual to an absolute tee. A long extension cord is not ideal in the workplace unless absolutely necessary. This is because it can create a major tripping hazard. So try to be located as close as possible to a power outlet. To prevent wear of your machine ensure that the electric current is the appropriate voltage for the motor. For a precaution it is recommended to connect it through a fuse or surge protector. 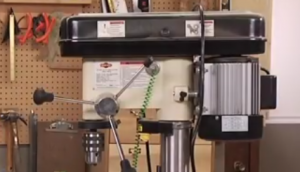 Bench top drill press machines should be mounted to your bench using bolts. It will require making holes in your wood or metal workbench surface. It is actually important to complete this step, because by mounting it you create a much safer environment and remove the possibility of knocking it over and causing injury. A floor drill, like its benchtop counter-part should be secured by mounting it with bolts. Again, this will require creating holes into the surface you plan to mount it to. Although mounting is important for safety, remember it’s easy enough to undo the mounts and make it portable again in order to take it somewhere else. This is a vital step to ensure that it will stand the test of time. It is recommended to clean the machine regularly as well as apply lubrication frequently to keep it running smoothly. It’s always a good idea to reference your machines specific guidebook for more detailed product specific maintenance guidelines as well. The drill press has a massive user base these days for all sorts of jobs. As usual with operating any machinery there are some operating risks. Thus, the operator must comply with a set of precautionary measures to ensure safety. The paragraphs below shall discuss a few key points in this regard. The first and foremost suggestion is that you start using the machine only after you are fully aware of its functionality. Go through the user manual in details and don’t hesitate to speak to the manufacturer if you are unsure or need clarification about anything. Depending on the surface that you will use it on, you should pick the relevant type of drill. For instance, when working on glass surfaces, you should choose your machine accordingly. To ensure your safety, and protect your eyesight and hearing you should always wear adequate safety gear, including safety glasses or a face shield etc. Remember, you should always remove the chuck key while operating. It’s useful to have the self-ejecting keys that will automatically eject, the moment you power the machine up. Following the tips suggested above will not only ensure your safety but, will enable you to make optimal use of the machine, preventing downtime and wear and tear. It is important that you comply with the safety measures stated in the user manual. A drill press is a must have if you’re serious about doing woodwork, metalwork, or you’re just an amateur hobbyist wanting to do some drilling. It is comparable to a hand-held drill but has so many more advantages. These advantages allow for all sorts of exciting efficient applications. A drill press provides a level of power and accuracy that you simply couldn’t get drilling by hand. It does this by utilizing leverage. Hopefully after reading through our detailed drill press reviews you’ll be very well equipped to make a wise purchase. After reading the information here you will also have an idea of how to get the best drill press for money. But not only that, you will be able to make the decision knowing you’ve considered the important factors regarding size etc. Another important factor is that you should always check out what kind of warranty is offered for whichever product you are interested in purchasing. It may sound mundane, but it’s actually an important part of the buying process. Even the most reliable tools and best models occasionally have faults or issues. Even if you’re extremely careful with how you use your machine, there’s a chance that a fault may have slipped through unnoticed when it was being manufactured. So that you can rest easy knowing your back is covered, I strongly suggest you check the warranty! And look at what kinds of issues it covers. If you have any suggestions of advice we could add to this guide, please let us know.